MARKET HOTEL is an all ages concert hall and neighborhood meeting place overlooking the elevated subway on the 2nd floor of a 140-year old building at Myrtle Broadway in Bushwick, Brooklyn, above Mr Kiwi Grocery. The mission of MARKET HOTEL is to find common ground between nightlife, culture, and community service, and to host artistic and community events that do not discriminate by age, background, socio-economic status, system of belief, or personal identity; that challenge norms to push cultural and artistic boundaries; and that appeal to a diverse and representative audience from within our local community and beyond. 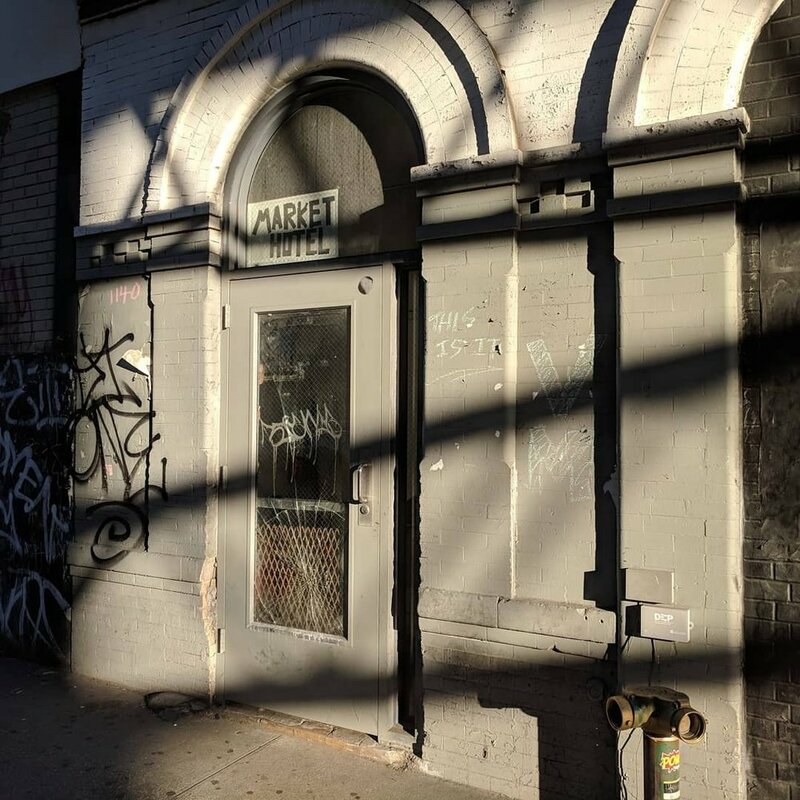 MARKET HOTEL is an historic event space that has been a neighborhood nightlife hub for Bushwick and Bed-Stuy, in many incarnations, for over 50 years. Built as a branch of Corn Bank in the late 1870's, the 2nd floor began life as a local nightclub in the 1960's, operating under names like the "Bristol Room" and the "Broadway Chateau," and hosting meringue, salsa, house music, and early Latin-hiphop events -- until ultimately closing amidst an enforcement crackdown following the "Happyland" disaster in the early 1980's. The 2nd floor stayed shuttered / dustily preserved in time for the next 20-plus years, save for a brief appearance in the movie "Ghost." In January 2008, the doors were cracked open again and MARKET HOTEL came into existence, as a home for several artists and as an under-the-radar all ages concert venue and art space, throwing guerrilla events in the unrenovated husk of the old nightclub that closed over 2o years before, with no heat or air conditioning, dodgy electrical systems, a plywood stage, no ventilation, and barely working bathrooms. MARKET HOTEL hosted hundreds of concerts, art installations, dance parties, and community meetings and classes over a few years, and gained international infamy in the music press and elsewhere. In April of 2010, NYPD forced the space to close to the public, and to seek renovations to reopen with proper occupancy permits, under threat of the building being "vacated" and the artists-in-residence thrown out into the street. An organization was formed to raise money and to guide the process of architectural renovations in-order to reopen to the public, and spent the next few years seeking funding and researching the City's code compliance process. MARKET HOTEL eschewed "crowd funding" as well as corporate and venture capital money in its fund-raising, and instead financed the high cost of renovations through small investments and loans from not-wealthy people, as well as pursued a do-it-yourself strategy to keep costs low, in hopes to provide an example that even ambitious projects can be accomplished by regular people of middle-class means. The process was slow and faced many challenges. In June of 2013, the last artists-in-residence willfully moved out of MARKET HOTEL in order for major renovations to begin. Improvements included fire sprinkler and fire alarm service; forced fresh air; an elevator; all new electrical, fresh water, and sewer lines; new lighting; a new exit staircase; new doors and windows; heating and air conditioning; all new bathrooms; a new stage; sound attenuation treatment; an all new sound-system; new bar and bar equipment; new fixed seating; and much more. The philosophy of the renovations was to change as little as necessary to create an architecturally safe space, and to preserve the historic features and character of the building. After two years of construction, trials and tribulations, funding challenges, bureaucratic and law enforcement delays (and occasional antagonism), MARKET HOTEL obtained approval to reopen its doors under temporary licensing for public assembly, with day-to-day licenses for alcohol, and hosted its first show open to the public in over 5 years, on December 16th, 2015. For the following two years, MARKET HOTEL hosted events sporadically under temporary licensing, continued making improvements, and overcame persistent bureaucratic and law enforcement delays. In June 2018, MARKET HOTEL received a Certificate of Occupancy, and a full on-premises Liquor License, and finally reopened as a fully-apportioned, fully-licensed, full-time concert hall. MARKET HOTEL now can legally host events any night of the week, with no particular time restrictions, open to all ages, and with a full liquor bar available for guests who are over 21 years old with valid identification.